Greetings witches, wizards and muggles! 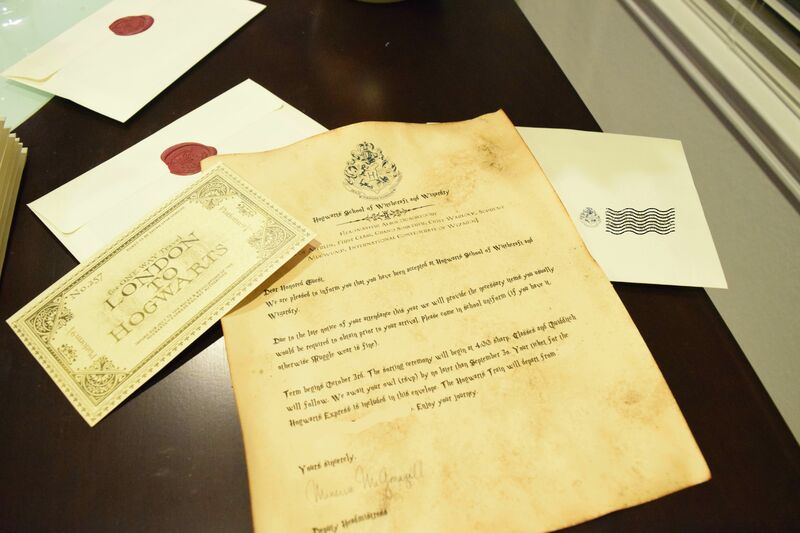 Today I want to share with you how to make your very own Hogwarts acceptance letter…or in my case party invite!! In case you havent guessed already I am a big fan of fantasy. If it doesnt take place in the real world chances are I am a fan. One of my absolute favorite “fantasy” lands is the Harry Potter universe. Its so complete you dont have to ask things like “I wonder where they keep their money” or “do they even have a government” that stuff is already answered for you! With the addition of Pottermore you have access to even more history and amazing information. 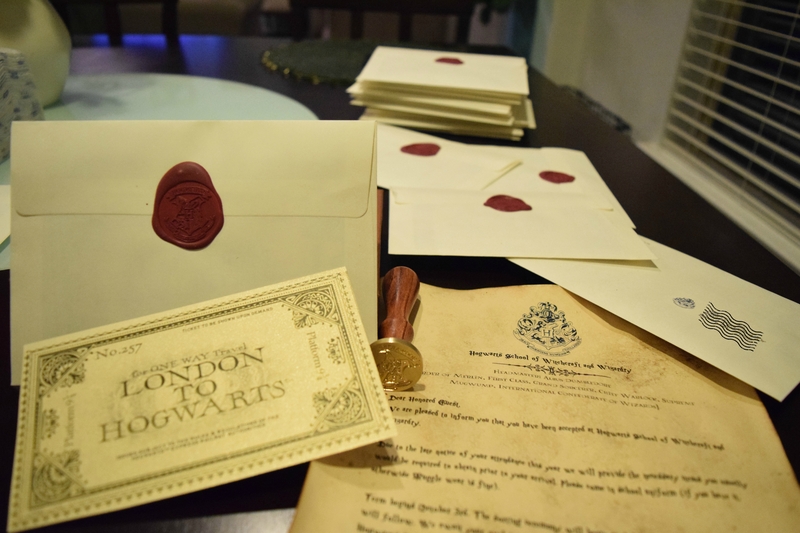 All this to say, its easy to do a Harry Potter themed party because dang there is just so much information to work with! Due to the late notice of your attendance this year we will provide the necessary items you usually would be required to obtain prior to your arrival. Please come in school uniform (if you have it, otherwise Muggle wear is fine). Term begins October 3rd. The sorting ceremony will begin at 4:00 sharp. Classes and Quidditch will follow. We await your owl (rsvp) by no later than September 3o. 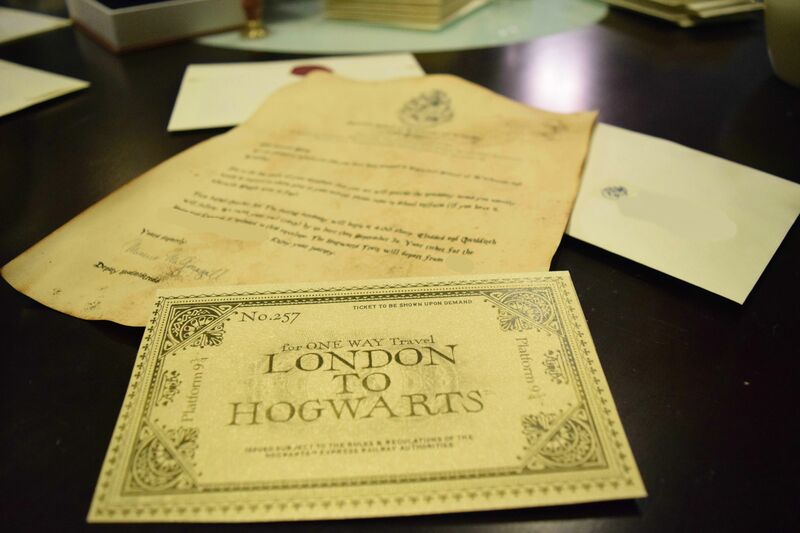 Your ticket for the Hogwarts Express is included in this envelope. The Hogwarts Train will depart from (enter address here). Enjoy your journey. (link to google docs pdf and word doc) The pdf has the fonts and everything I used, the word doc doesnt but does have the images. I used ivory cardstock so the paper already had the off-white look and would be sturdy enough to handle the aging treatment. You can buy individual sheets from office max and such but I actually found that Michael’s had a smaller pack (50 pages) of better paper and with the 40% coupon they usually have that was the best deal I found. After I printed all the invitations it was time to age them. A note on printing. I was worried the ink would come off and on some of the invitations the ink did come off a little. Be warned, DO NOT RUB TOO HARD during the aging process this will remove the ink. Just proceed with caution and you will be fine. Prepare a cup of coffee, we have a Keuring which was perfect. I had Joe save his used K-cups from the weekend before to have coffee grounds on hand. One k cup is enough for about 7-8 invites. Open the k cup and remove the coffee grounds either onto a plate, bowl, whatever you want. You will be grabbing these with your hands so whatever works best. Place one invitation on a cookie sheet (note, I found that a dark cookie sheet worked better than the really light ones but of course use what you have you will just need to adjust cook times) and pour coffee over invitation. You want enough coffee to cover the whole invitation but not too much that the invitation is absolutely swimming in coffee. Pour coffee ground over invitation. I left some larger patches and sprinkled in other area, do whatever you feel like! Let this sit for a few minutes to start to dissolve. Use a papertowel and soak up the extra coffee. Here is the first caution of dabbing. Just soak up the liquid coffee, its ok to leave the coffee grounds on the paper, better actually it gives a better aging effect. If you try and wipe off the coffee grounds you may mess up the lettering. Place cookie sheets in oven and cook for around 15 minutes. This time widely varies on how wet the paper is, the color of your cookie sheet, thickness of paper and so on. Keep and eye on the first batch then you will get a feel for how long the rest will take. Mine took on average 15 minutes. Once the paper is dry and seems like it will crack if you touch it remove from oven. Now you can gently wipe off the coffee grounds. Again gently, you could still remove the ink. The grounds will come off fairly easily if the paper is totally dry. Part one of the invitation done now its on to the ticket. Arguably the most important piece as without it you cant board the train. I was lucky enough to get a ticket when I visited the Wizarding World of Harry Potter last year. I took this ticket to Kinko’s armed with gold shimmer paper and asked them to copy and cut the tickets. Since the shimmer paper was scrapbook paper (IE 12×12 a weird size) it was an ordeal getting these babies printed and cut but it was totally worth it. If you dont have access to a Hogwarts Express ticket there are plenty of printable online but if you have the option to go authentic, go authentic. 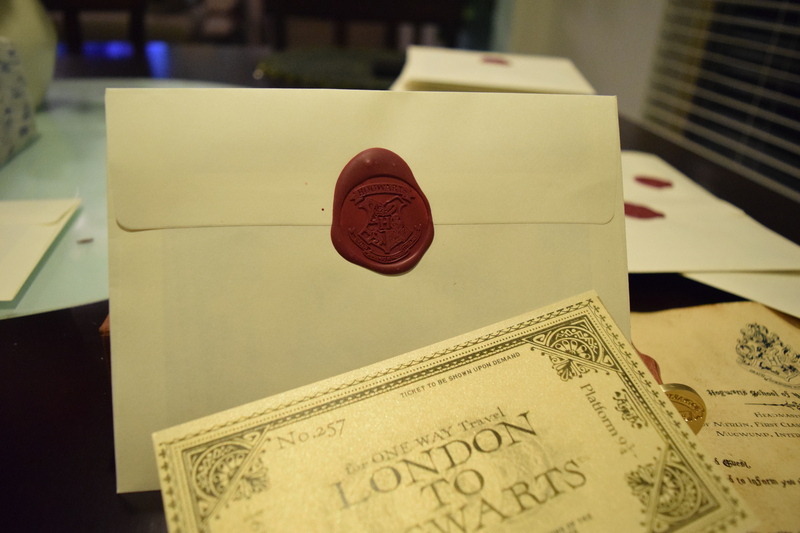 Last step in invitation prep was the Hogwarts crest seal. 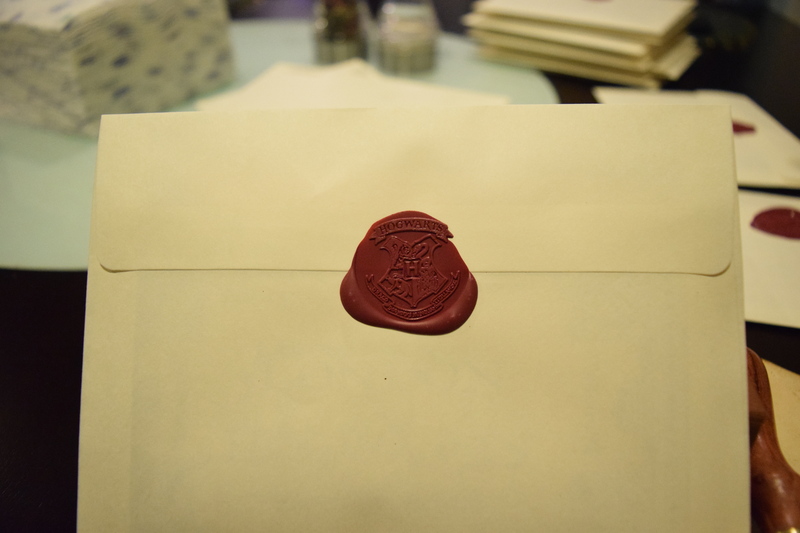 I love wax seals, they are awesome and old school and fantastic. I got this set from amazon. It was ok, not the best but the seal worked great and the wax colors were pretty quality stuff. It took some trial and error but what we ended up doing was cutting the wax into small little chunks, melting them with the provided candle in the provided spoon and dropping onto the envelope, quickly pressing the seal into the wax then voila! 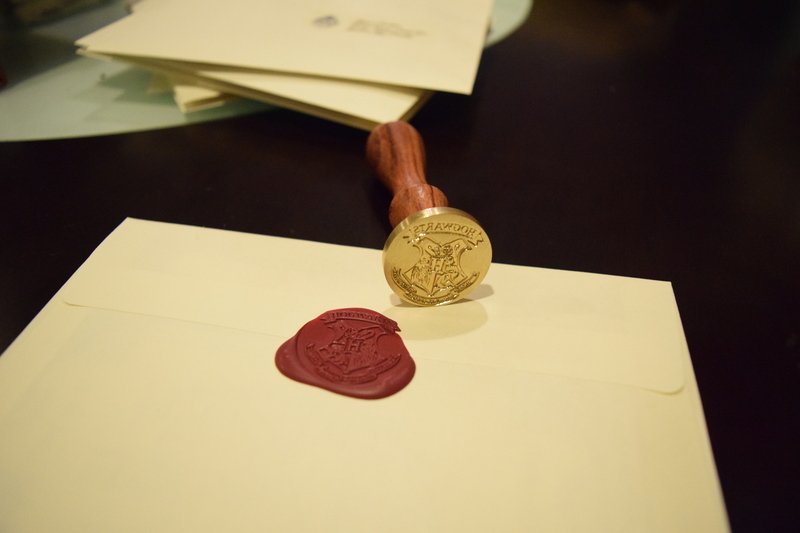 Beautiful wax seal!! The final touches were the address labels, return address labels, and stamps. The labels I made in avery using clear labels I had leftover from my wedding (6 years ago, good thing I hung on to the extras). Avery has some great templates and customization options. For the stamps I tried to make my own by zazzle didnt like the image I wanted to use, some crazy copyright story 😉 I did find that USPS still makes Harry Potter stamps so of course thats what I got. I didnt take any pictures of all that because hey Im not crazy Im not putting my address or other peoples on the internet! Silly geese! CHIME IN!! Have you hosted a theme’ed party before? What was the theme? Do you love Harry Potter? Thanks! It’s still my favorite detail from the party for sure!